VEGGIE PUCK is fiber, vitamins, minerals and phytonutrients! Rainbow of puck sized super foods! I’m forever focused on hunting down ways for clients to make food greener! Certain criteria capture my attention! Vitamin, fiber and mineral rich? YES! Eating a wide range of rainbow colored fruits and vegetables helps heal the body. Eating high fiber is non-negotiable. Ask yourself: Do you get 35 grams of fiber daily? Fiber slows down chewing, promotes release of digestive enzymes, helps prevent diverticulosis and hemorrhoids. Fiber speeds up transit time and acts as an intestinal scrubber, helping to eliminate toxins. I stress in all my blogs in the same way even that FIBER is your friend! Cooking can be quite the chore when time is of the essence. Frozen veggies are an easy alternative BUT I found plant power which reaches a whole new level! 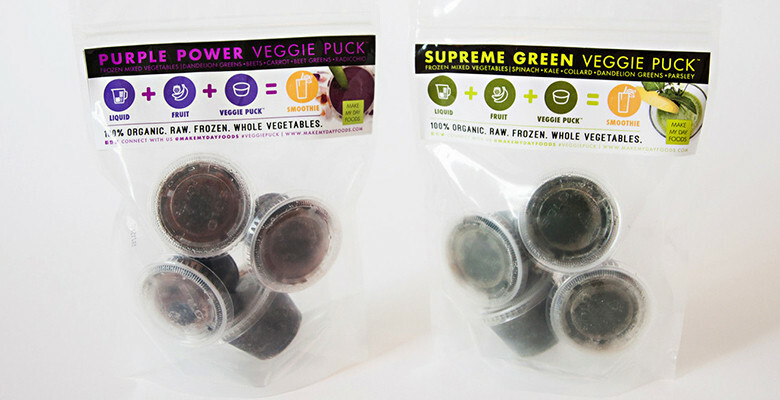 The VEGGIE PUCK is a frozen puck of “purple power” or “supreme green” that makes it simple to get a wide variety of vegetables daily without excuses! BEETS are an excellent source of energy. They are high in Vitamins B9,C and particularly high in the mineral Potassium. Beets are great for bladder support and aid circulation. BEET GREENS are a rich source of beta-carotene, calcium and iron. In herbal medicine beet leaves are used to treat minor ailments such as a headache or toothache. This leafy green is go to help for the spleen and gall bladder. CARROTS are a great carbohydrate as well as crazy high in beta-carotene, precursor to Vitamin A. Carrots contain powerful anti-oxidant activity and may offer cancer fighting protection. Consumption of carrots helps cleanse the liver. DANDELION GREENS are high in potassium, iron, calcium and contain beta-carotene. Dandelions are nature’s diuretic as well as aiding gall bladder, heart and liver. RADICCHIO is an anti-oxidant and high in Vitamin K. Loving this leaf! You will also benefit from inulin, blood sugar regulator. Radicchio may help reduce age related macular diseases since it boasts high levels of zea-xanthin and lutein. Radicchio helps produce bile, promoting healthy gall bladder. Adding the puck to any healthy liquid makes the perfect way to wash down morning supplements! It’s an easy all-day energy veggie water. Incorporating fresh vegetable juices are lower in sugar than fruit juices. Detox is all the buzz but baby steps is key! Adding couple veggie energy juices daily sets you up to handle a CLEANSE! 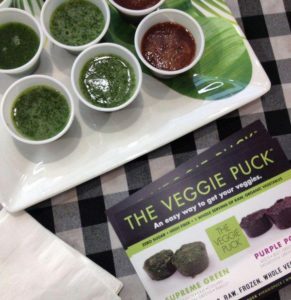 Spring is on the way, VEGGIE PUCKS are an ideal first step to prepping for a raw diet or juice cleanse! Throw the puck into hummus to make a 5 veggie dip! Make healthy spaghetti sauce! Power up any protein power! Add to spaghetti sauce, chili or stew! SPINACH is high in both Vitamin C and A. Thinking of getting pregnant? B9 containing spinach helps reduce the risk of spina bifida. Potassium helps with blood pressure regulation and iron helps anemia. Pancreas and large intestine will love you for extra spinach! KALE contains lots of Vitamin C, B9 and beta-carotene. Kale is chocked full of phytochemicals which may protect us from cancer of the digestive system. Indoles found in kale boost liver function. Indoles also help breakdown the female hormone estrogen, offering some protection from hormone dependent cancers such as breast and ovarian cancer. COLLARD GREENS are one forgotten vegetable. I am surprised daily by the massive number of people who are clueless to collard greens. They contain Vitamins B1, B5, B6, K, E to name a few. Iron, magnesium, copper, folate….. I could go on forever!! Lowering cholesterol as well as countering carcinogens is just two of tons of reasons the veggie puck contans collards. DANDELION GREENS are so powerful they are in both veggie pucks! Love incorporating this weed into client protocols. Dandelion flushes out sodium without jeopardizing potassium. PARSLEY is high in Vitamin C. It’s anti-viral and promotes wound healing. Love adding parsley if varicose veins or adrenal fatigue are an issue. Easy gourmet meals are the key to success! I LOVE adding ground cashews or pine nuts to either puck for an easy pesto sauce! It’s always gourmet on the go and ready to use on pizza, crackers and of course spiralized zucchini noodles! The VEGGIE PUCK helps makes cooking holistically quick, easy and affordable. No more wasted produce! Getting your greens, rather the whole range of brillant colors means loving your body from the inside out everyday! For more holistic love read my garlic and ginger blogs!